Allegiant was an extremely difficult book for me to rate. Like many readers, I was expecting one last blast of excitement, but got a pretty tame unrolling of the final book instead. I am both disappointed and impressed with Roth’s last book in the Divergent series, and I’ll try my best to put my thoughts into a comprehensible review. Be warned, spoilers ahead! 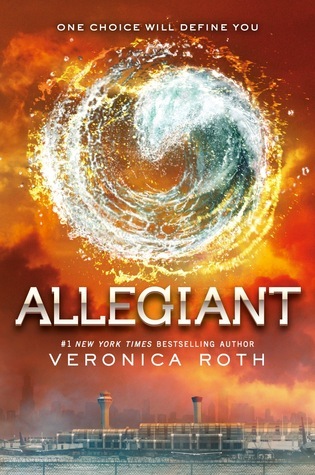 For a majority of the book, Allegiant moved along at a very slow pace. And when I say slow, I mean at a snail’s pace. Halfway through the novel I was getting kind of frustrated by the lack of action and how the story was panning out. What Tris and co. discovers outside of their fenced Chicago was a secret that left me going, “oh…is that all?” I will say that I was not impressed with how the story was going at that point. There had been so many lead ups to this final book, and the explanation ends up being about some genetic experiment?! Are you kidding me. After the loss of so many characters, I thought that the explanation for the whole series was quite a big cop out. Don’t get me wrong, I understand Roth is trying to show us the extremes certain people will go to in order to correct society, where sacrifices has to be made for the greater good. But in saying that, I thought she could have approached this message in many different ways that were much more exciting. While I understand why the dual perspectives had to happen, I was not a fan of it either. I know many people got confused over the voice of the two characters, which blended together, but I must say I didn’t get too confused. It was easy to tell when Tobias was speaking because of all the whinging. All he really does is feel sorry for himself, for being a Genetically Damaged (GD) individual and for having parents that do not care about him. Once again, he seems to do what he wants against Tris’s better judgement. By the point he and strained their relationship to the point of no return, I was ready for them to actually break up. I really had had enough of Tobias. Tris on the other hand is still a character I truly admire. She grows stronger as a person, and you really see the Abnegation within her come out. She’s able to take on certain responsibilities that no one else would, so I really admire how Roth handled her ending. It takes a very brave author to write a story as it should be; not to appease people, but to take it on the path it was always intended to. When I think about the Divergent series as a whole, I can see that Roth did always intend to have such an explanation for the factions and why everything was happening the way it was. I will applaud her for sticking to such a plotline, even though she knew her readers may have wanted something different. We as readers should also remember that essentially, this is the author’s story. This was how it was always intended to be, and we should not be blaming Roth for only writing something she had always intended to. This also goes for the big twist ending. I admit I cried buckets when it happened, especially in the final chapters. While I wasn’t exactly shocked by it happening, I was still saddened by it. I really applaud Roth, a famous YA author for doing something dozens of others would never have the guts to. And her ending became all the much better because of it. I read a book recently where a similar thing happened, but the authors eventually couldn’t go through with it and their character just came back alive. It was their inability to do something drastic when it was needed that put me off the entire story. In Allegiant’s case, I really admired what Roth did and the story grew from a 2 star rating to the 3 star rating because of it. Unfortunately, I could not rate it any higher because overall as a novel, there were just too many loopholes. I didn’t believe for a second that any of the characters could have remained so sane after having been told their whole life was a lie. And it upsets me that Roth had so many wonderful side characters but we rarely got to see any of them. I especially missed Christina and her personality. She appears here and there but it was really her time to shine. Overall, Allegiant was a disappointment yet should receive kudos for its bravery. Roth does what many authors wouldn’t, and I believe her book was that much better because of it. Unfortunately, the novel was still a disappointing end to a good series.